This page contains information about our shipping policies, methods, and restrictions. Can't find what you're looking for? Contact Us and we'll be happy to help! Most products purchased from 5Gstore will ship from our main warehouse location in Crystal Lake, IL (special order items may ship directly from the manufacturer). 5GStore.com can only ship to physical street addresses - no PO boxes (except in cases where UPS Surepost or FedEx Smartpost is an option). USPS orders (in cases where USPS is a shipping option) cannot ship the same day they are placed; they will ship the following business day. Orders placed Friday after the 3PM CST cutoff time or on Saturday / Sunday / Holidays will ship on the following business day. Wire transfer or check orders will ship when the payment clears. Free and flat-rate shipping offer details and exclusions: Flat-rate shipping offers are for standard shipping and are available only for customers in the contiguous US (Alaska, Hawaii, Canada, etc are excluded). Order total must be over $99 to qualify, and bulk/volume/discounted orders do not qualify (orders over $10,000 or over 50 lbs and/or orders with special volume pricing). One Talk orders are not eligible for promotional shipping. For items shipping from our main warehouse in Illinois, 5Gstore can ship FedEx or UPS Ground, Express, 2nd Day, Overnight (including early AM where available), and Saturday Delivery, as well as SurePost or SmartPost in select circumstances. For all services, a "day" is a normal business day, not a weekend or holiday. When checking out at 5Gstore, the estimated delivery time for each service method is displayed along with the price. 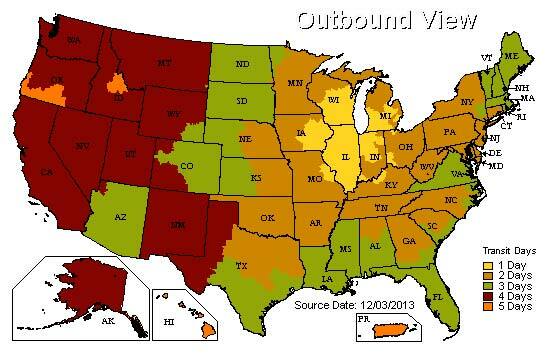 We also offer USPS as an option for shipping addresses in Alaska and Hawaii ONLY. Please note that because USPS orders take longer to process, they will be shipped no sooner than the next business day. Same-day shipping is not available for USPS orders, even if placed before the 3pm CST cut-off time. 5Gstore makes every effort to ensure that ALL orders are shipped in a timely fashion. "Will Call" pickup is available for most products at our Crystal Lake, IL warehouse by appointment only. If you are interested in picking up your order, please call us before placing your order. We email tracking numbers by 5pm CST the day your item ships. You can also Log In to your account any time and see the status and tracking number. Please note that your tracking number may not register with the shipping company until the package actually leaves our warehouse. Free and flat-rate shipping offer details and exclusions: Flat-rate shipping offers are for standard shipping and are available only for customers in the contiguous US (Alaska, Hawaii, Canada, etc are excluded). Order total must be over $99 to qualify, and bulk/volume/discounted orders do not qualify (orders over $10,000 or over 50 lbs and/or orders with special volume pricing). If there are any problems with your order (e.g. incompatible products, trouble with your shipping address, etc) you will be contacted promptly by phone and/or email, so please double check that the contact information you provide is accurate! Any refused shipments will be subject to an automatic 20% restocking fee. 5Gstore reserves the right to cancel or void any coupon or promo code at any time. Expired, unauthorized or duplicate coupon or promo codes will NOT be honored. For your protection, your 5Gstore order MAY be shipped with a signature required. WEATHER AND MECHANICAL FAILURE DELAYS: If your package is being delivered to an area affected by severe weather (snow, hurricanes, heavy rains and flooding, etc), please note that neither 5Gstore nor the shipping company can be held responsible for any delays caused by weather and FedEx/UPS/USPS do NOT issue shipping refunds for shipments delayed by weather. Additionally, neither 5Gstore nor the shipping companies are responsible for what are considered "mechanical failures" (e.g. problems with one of their planes that results in a delivery delay). Always check your tracking information at FedEx.com, UPS.com, or USPS.com for up-to-date information on your package's status. US Customers: Sales tax is only charged if your shipping address is in Illinois. If your shipping address is in any of the other 49 states or territories, there is NO sales tax. Tax Exempt IL Businesses: If your shipping address is in Illinois and your business is tax-exempt, you can fax or email us a copy of your Tax Exempt or Reseller letter prior to ordering and tax will not be charged. International Customers: Duties and taxes vary in different countries. 5Gstore is happy to ship internationally! 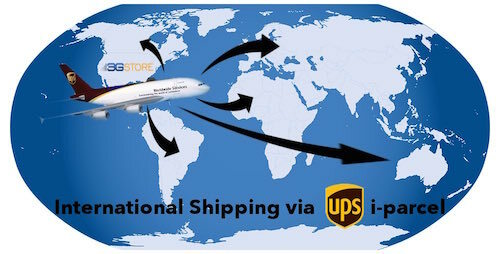 With the exception of Canada, all international orders are processed and shipped through UPS i-Parcel. International orders must be paid for via credit card or wire transfer. Paypal is not an option for international customers. Unfortunately, some products are not eligible for international shipping due to manufacturer restrictions. 5Gstore cannot guarantee compatibility with international equipment. International customers fall under the same return policy as US customers and of course have access to our technical support, but keep in mind that our support hours are 9am-5pm CST (making some international support calls difficult). Additionally, international shipping charges are NOT refundable and the customer is responsible for paying for return shipping if you choose to return your order, so please plan ahead! Duties and taxes vary in different countries.